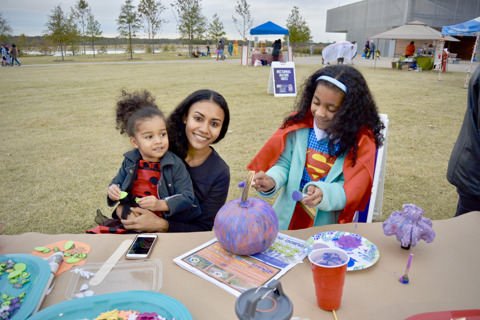 Starry Nights, presented by International Paper, is a family-friendly holiday experience with drive-through and walking trails of light displays, plus magical FedEx Mistletoe Village! 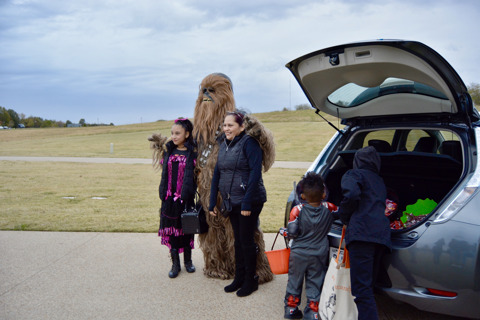 Starry Nights is the largest annual fundraiser for Shelby Farms Park, and it's a holiday tradition for thousands of families. 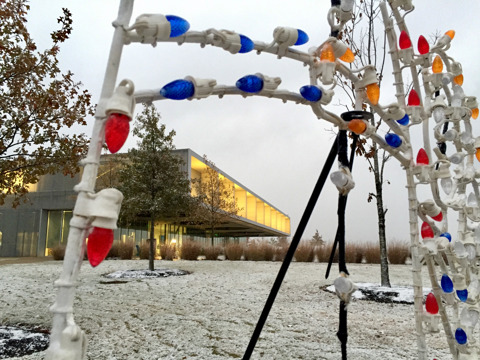 Thousands of lights twinkle and shine throughout the Park and the First Tennessee Foundation Visitor Center is transformed into magical FedEx Mistletoe Village which is a hub for holiday fun! But, this long-standing holiday tradition doesn’t happen overnight. There’s a lot more to it than just flipping on the lights--planning for the 38 day event begins when the Memphis heat is still lingering! The entire Park Operations (Ops) team begins work in early October by prepping power connections and preparing wiring. The actual set up of displays begins on November 1, as soon as the Park’s Halloween festivities are over. 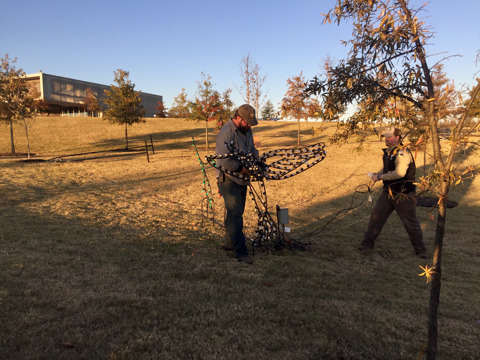 The Ops team spends cold days setting up displays and installing lights, followed by cold nights checking and adjusting the displays. Breaks from setting up on cold days are always welcome! 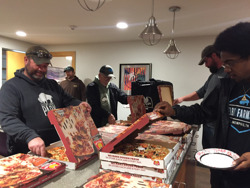 Special thanks to our new friends at Marco’s Pizza who provided hot pizza during the cold days of Starry Nights set up! Even after the show is open for Visitors, the Ops team continues to work on the event daily during the run of the show maintaining and repairing the lights. 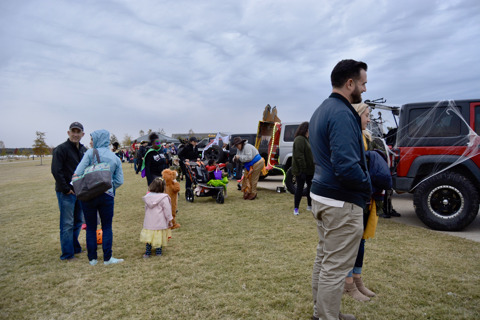 Once all the displays are up and ready to go and Starry Nights is officially open, more than 1,000 volunteers help keep this event shining brightly. 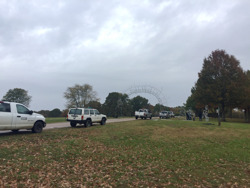 Every night, the Starry Nights volunteers arrive several hours before the show opens and stay several hours after the last visitor leaves the Park. These volunteers brave the cold temperatures and help with multiple tasks - whether it’s directing traffic and interacting with Visitors or prepping ponies and camels for the nightly rides and helping Santa Claus our volunteers keep this event merry and bright. They even help us on Thanksgiving night, Christmas Eve and Christmas night! So, this year when you experience the magic of the holidays at Starry Nights, remember the magic that has happened behind the scenes! Happy Holidays from all of us at Shelby Farms Park! 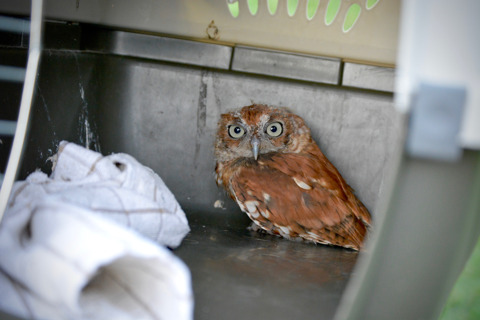 This cute little screech owl was recently found near a Park trail as an abandoned chick. 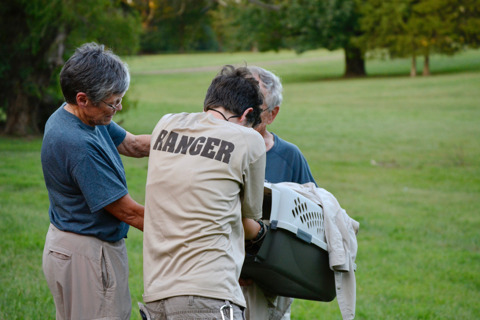 He has since been cared for by the talented team at the Mid-South Raptor Center and was successfully re-released into the woods here at the Park! What should you do if you find an animal in the Park that looks alone or like it needs help? Give us a call at (901) 222-PARK! Please don't touch or attempt to move the animal -- our wildlife is, well, wild! 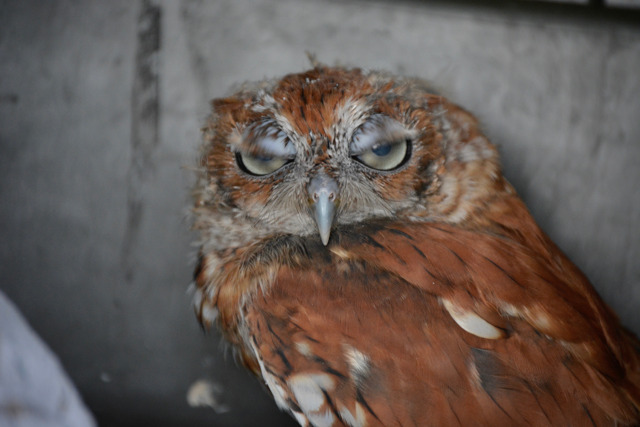 We'll take it from there and involve our network of animal experts as needed, just like with this screech owl! Want to help make Park life twice as nice? A generous anonymous donor will match all donations made to the Park by June 30, 2018, up to $25,000! 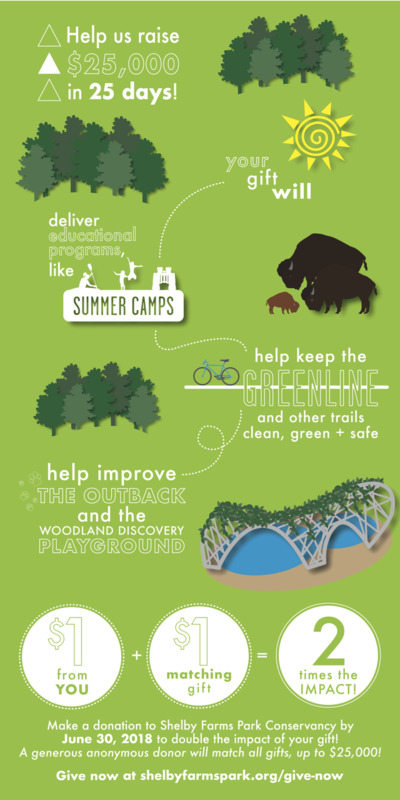 Check out the ways your gift will help the Park grow below, and click here to help us reach our goal! 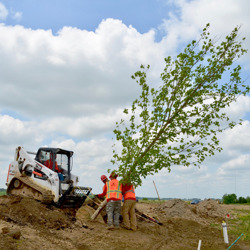 Check out these photos from May 19, 2015 of the first tree being planted in Heart of the Park and of the first beam being installed at the First Tennessee Foundation Visitor Center! Did you know that these happened at the same time? Heart of the Park has come a long way! New Greenline Connection Coming Soon! We have big news, Park fans! Over the course of the next few weeks, a new Greenline access point will be constructed at the Appling Road crossing! 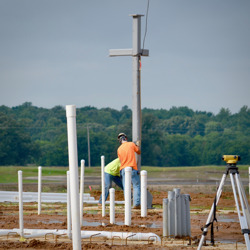 This much-needed access point will physically connect the Greenline with the paved Chickasaw Trail in Shelby Farms Park. We are excited about this new connection, which wouldn’t have been possible without support from Mid-South Regional Greenprint and Shelby County Commissioners Steve Basar, George Chism and David Reaves! Over the next few weeks, you may experience some temporary disruptions in your regular route, but have no fear -- the trails will remain open! Gates 9 and 10 will be temporarily and intermittently closed as the new connector trail section is graded and paved. You will still be able to access the event field and Chickasaw Trail from Gate 8, and the Woodland Discovery Playground, Go Ape, Pine Lake Boat House, Stables and Beaver Lake will be accessible via Gate 1 off of Farm Road and through the Event Center entrance off of Walnut Grove. We can’t wait to hit the new trail with you, and we appreciate your patience as we complete this exciting project! Stay tuned for opening details! Every year, Arbor Day is the last friday of April, which means we will be celebrating our trees today! Arbor Day first originated in 1872 in Nebraska with J. Sterling Morton. A nature-lover and journalist, Morton began to spread the word about the importance of planting trees and keeping the land green in his newspaper. He and his fellow pioneers loved the aesthetic of trees and also knew that they would be necessary to block the sun, keep the soil in its place, and to be used for wood that they needed to continue building their community. Later in his career, as secretary of the Nebraska Territory, Morton proposed a holiday for planting trees and it was happily approved. It was decided that as part of the celebration, there would be a contest for who could properly plant the greatest amount of trees on the first annual Arbor Day, which was on April 10, 1872. More than 1 million trees were planted on this day! By 1882, Arbor Day was recognized nationwide. The first Arbor Day was a raging success, so let’s make this one just as great! There’s no better place to spend your Arbor Day than the largest green space in Memphis. 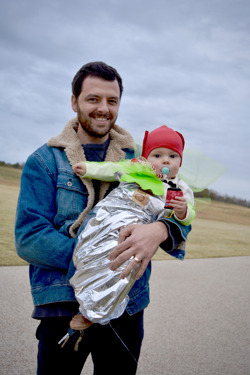 Appreciate your trees and spend your April 27 with us at Shelby Farms Park! Looking for a unique way to celebrate Arbor Day? Help Shelby Farms Park plant One Million Trees. Adopt a Tree today or symbolically plant one to honor or remember someone special. 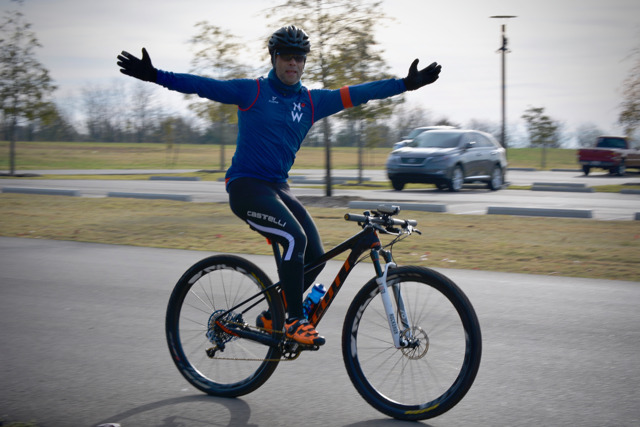 With more than 40 miles of both paved and unpaved trails, Shelby Farms Park is the place for you, whether you are just biking for fun or mean serious business. The Greenline is a rails to trails project that now has 10.65 miles of paved trails that connect pedestrians and cyclists from Midtown all the way to Cordova. With 15 different access points, you’re never too far from the trails, so why not use them! Don’t have a bike? You can rent one from us! We have two convenient locations: The Hyde Lake Wheel House at 6903 Great View Drive North or The Greenline Wheel House at 6489 Mullins Station Road. Rentals are available for either 2 or 4 hour rental blocks. We have mountain bikes, hybrid, cruiser, trail, tandem, and kid bikes ready and at your service. Please remember that renters must provide a valid driver's license or government issued ID, but riders can be any age. We provide a helmet with each rental, and anyone ages 16 and under must wear their helmet while riding. Safety first! We know that sometimes things don’t always go as planned, so we have four free bike repair stations located along the trails for your convenience, just in case something were to get out of gear! 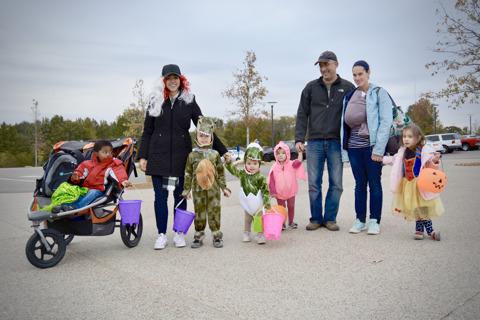 Locations include the 0.0 mile marker of Shelby Farms Greenline, Tour de Wolf Trailhead, Wolf River Pedestrian Bridge, and Germantown Trailhead. Are you more of an extreme biker? We’ve got the place to be for you too. Shelby Farms Park BMX is located across the street from Hyde Lake. The track has recently been completely renovated and is ready to see what you’ve got! With novice, intermediate, and expert levels, there is competition to be had for all levels of BMX riders. Come with a friend, a date, your kids, or on your own -there are plenty of bikes for everyone, so don’t miss out! From planting trees to removing invasive species, Park Rangers are always working hard to keep Park forests healthy and looking good! With hundreds of acres of woods, it's a big task! Park forests are plagued with an invasive species of plant -- Chinese privet -- which prevents new growth from occurring. Removing privet isn't easy to do, but our team works hard to strategically tackle the issue. It's something we'll be battling for a while, but knowing that the forests will continue to thrive for generations because of the work happening today is a big motivator! Another issue that our forests face is segmentation. What is today a park was once a thriving prison farm, and the land was shaped to meet agricultural needs. In order for fields to grow, vast sections of forests were removed, leaving island ecosystems scattered across the land. 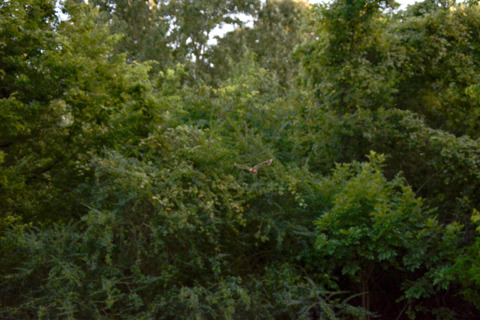 Shelby Farms Park Conservancy has been and continues to work toward strategically reconnecting these pieces by removing invasive species from existing forest areas and by planting native trees and plants. As the health of the forest improves, both native and migrating animals benefit. Make a general donation -- every gift helps! Caring for a big park is a really big job! There are thousands of Park fans who volunteer to help clean up and green up the Park and Greenline each year, but there is also a dedicated team that cares for the Park 365 days a year. 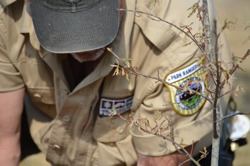 The Park’s Rangers + Operations Team are some of the most visible caretakers of this special space, but much of their work takes place right under our noses -- often including projects that are seemingly invisible, but that greatly improve the visitor experience and the life of the plants and animals that make their home on park grounds. While our team can’t be in all 4,500 acres at once, they do a great job of making it feel like they can! Over the next few weeks, we’ll be sharing a closer look at the hard work that goes into caring for this special space! Park mornings start early! Our gates open at sunrise daily, which requires Rangers to arrive pre-dawn to get the process started. 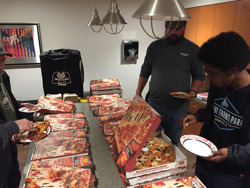 In the dead of winter, some of our team gets to work at 4:30am! Shelby Farms Park Conservancy’s mission is to manage, operate, restore and improve Shelby Farms Park in partnership with and for the public. The Park Operations Team (aka Park Ops) is responsible for elevating expectations, standards and resources for landscape and facility management and maintenance, while keeping visitor experience in mind. 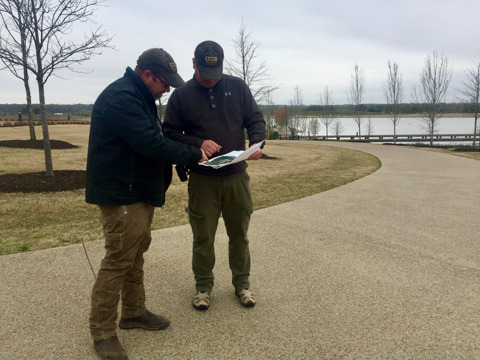 This team is at the forefront of Park care, helping ensure that the 4,500 acres of Shelby Farms Park and 10+ miles of Shelby Farms Greenline are clean, green and safe for the more than 3 million annual visitors that come to run, bike, explore and play in this incredible place. The Park Operations Team is talented crew! 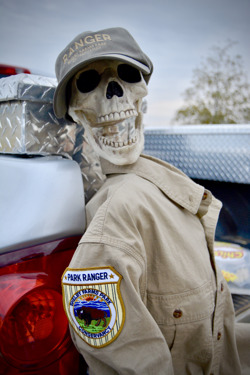 This team is made up of Park Rangers, the Maintenance Team and Operations Coordinators. The team is comprised of innovators, educators and very hard workers. While you may not always see a Ranger or Maintenance crew member when you visit the Park, you will always encounter the impact of their work. 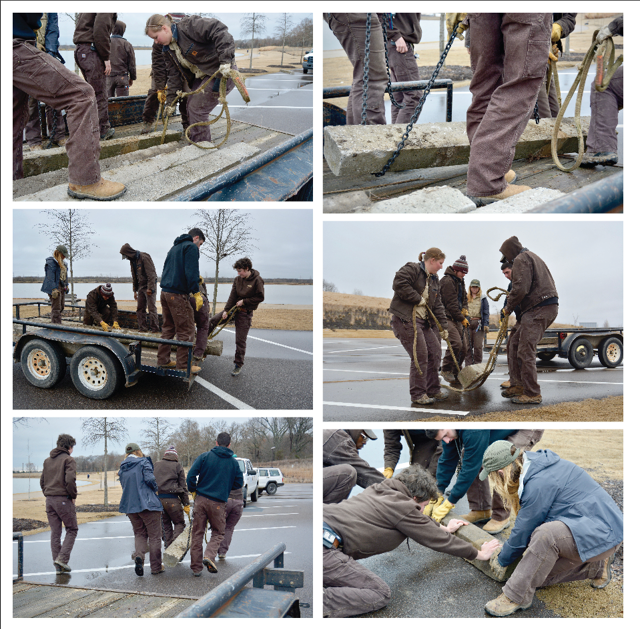 Ops Team installing parking barriers in the newly revamped Hyde Lake Boat Launch parking lot. From day-to-day care and maintenance of the grounds to long-term improvement projects that will positively improve visitor experiences over time, the Ops team is always thinking about how to keep the Park in tip-top shape. The Operations Team works diligently to complete complex improvement and repair projects while minimizing the impact these projects have on visitors. While some of their work would be much easier if the park closed for a day or two, their innovative and creative solutions for keeping as much of the Park open as possible at all times make their work all the more impressive! If there is an opportunity to keep a trail or play space open and safely accessible while work is being done on it, the Ops team will always choose this option. Now that you know a little bit about why we do the work we do, stay tuned for more behind-the-scenes posts about the Park crew! Mark your calendars! Starting March 11th, we will all have one extra hour of daylight. 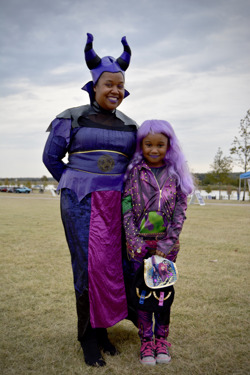 Spend it wisely and use those 60 minutes doing something fun and active with us at Shelby Farms Park! 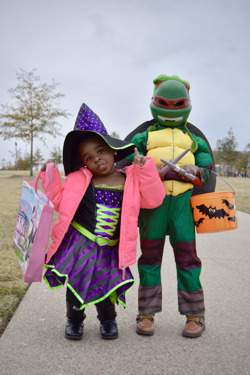 Here are 10 things to do at Shelby Farms Park with your extra hour of sunlight. Squeeze in that workout that you just haven’t had the time for! We all know it’s hard to get motivated to get fit after a busy day when it’s dark before dinner. So use this extra bit of daylight to finally get around to it! Join us for a free Get Outside! Fitness class. The schedule can be found here. Group workouts not your thing? 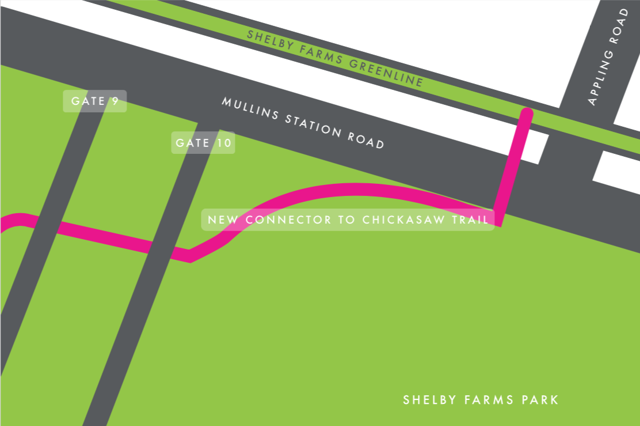 Ride a bike or take a hike on the Shelby Farms Greenline! With more time on your hands, there’s no reason not to hit these 10+ miles of trail and get the most out of your day. Get more details here or find your bike here. Bring the whole family! 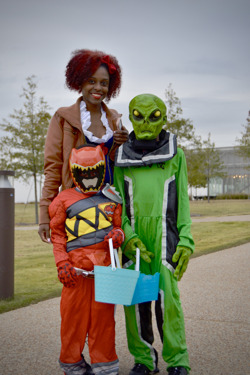 Daylight saving time affects the kids too, so why not bring them along. Hit up the Woodland Discovery Playground and let the kids enjoy the extra hour jumping and climing and having fun being a kid.. Get more details here. If your kids are too old for the playground, don’t worry! You can still enjoy some family fun with a Trekker Family Hike while learning about Park history, birds, buffaloes, and more from one of our Park docents. Held on the third Sunday of every month, this is the perfect way to spend your extra bit of time with the family. Learn more here. And don’t forget about the pup! Let go of the leash and let your dog enjoy the Outback Off-Leash Dog Park. Find some fresh air for everyone! Be sure to give our rules and tips a glance here before visiting. Tired of being stuck inside during chilly, dark winter evenings? Pack a picnic for dinner! There’s no better combo than fresh air and fresh food, so get a group together and rent a pavilion to optimize your day and get outside! We have all been waiting for the day its not dark around five or six and it’s finally here, so don’t waste a moment of it! Rather have someone else make the food for you? Head to The Kitchen BIstro! You can still enjoy an excellent meal outdoors on our fabulous open-air porch overlooking Hyde Lake. Watch the sun set an hour later with some fine dining or a cocktail. Be sure to check out their menu. Don’t forget that once it warms up, you can start using your extra spring hours doing even more at Shelby Farms Park. Rent a kayak, canoe, or paddleboard! Go fishing! We have 20+ lakes and ponds, so don’t hesitate to hit the water this spring! See all your options here. Warmer weather and longer days means it will also be perfect conditions to hit the trails and go horseback riding here at Shelby Farms Park. Learn how to saddle up here. And finally, Go Ape on our treetop adventure, which will re-open starting in March! Swing into spring and traipse through trees on these obstacle courses and ziplines. Learn how to book your session here. With so much to do, there’s no reason to stay cooped up inside! Make the most of your day, every day, and spend your extra hours with us at Shelby Farms Park this spring! 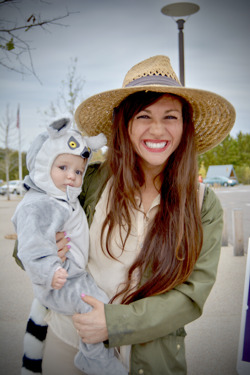 Celebrate World Wildlife Day with Shelby Farms Park on March 3! With 4,500 acres of land and 20+ lakes and ponds, we are home to countless species of wildlife. To get everyone excited about this holiday, here are some highlights of the various birds, plants and flowers, mammals, fish, amphibians, and reptiles that you should be on the lookout for at the Park! Head to one of our lakes and chances are, you may see a Mallard Duck. Known for their signature emerald green head, these are the most common wild duck in North America. Male Mallards are referred to as “drakes” and females are referred to as “hens.” Both possess a vivid blue stripe on the back edge of their wings. They have thick, fluffy feathers close to their body to keep them warm, and feathers that are made waterproof by a liquid that is produced near their tail, on top of the other feathers. These migrating ducks can fly up to 40 mph and may lose up to 20-50% of their body weight during their journey. Come summer, one beautiful flower that you can witness blooming at the Park is the Golden Tickseed. A part of the sunflower family, this flower’s plant can grow anywhere from 8 inches to 5 feet tall. However, most are in the 2-3 feet range. This flower gets its peculiar name from the fact that post-flowering, it produces small, dry, fruits that resemble bugs, or ticks. The invitingly beautiful Golden Tickseed is also known to attract bees and butterflies, which makes it all the more appropriate for World Wildlife Day. Though buffalo are not native to the Park (they were brought here in 1989 by Tommy Hill), they are still an animal that thrives here and one that we revere so much, we made it our logo! You may have heard these huge (they can weigh up to a ton and are North America’s largest land animal!) creatures referred to bison and been confused about what to actually call them. The answer is that if you want to be more scientific, you can use “bison,”but the name “buffalo” is more closely connected to the animal’s history in the Western United States. In the wild, buffalo tend to give birth during thunderstorms as a safety measure for their calves so that the sounds and smells associated with the birth are masked and it is harder for predators to find them. And speaking of baby buffaloes, we had 12 at the park last year! 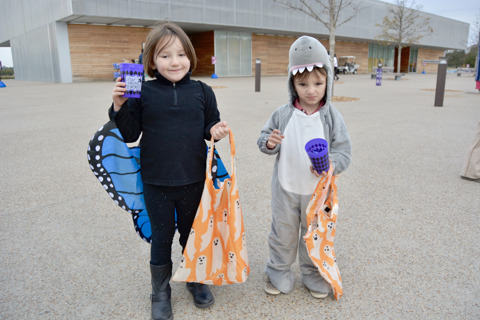 Come and see our favorite animal at the Park! Largemouth Bass can be found in our Shelby Farms Park ponds and lakes. These solitary fish tend to hang out on their own and are also known to be the predator within their environment. They possess what is called a “lateral line” that gives them a strong ability to detect even the smallest vibrations in the water. If you’re a fisherman, (and bass are the official sport fish of Tennessee), one thing to keep in mind is that bass can “learn from their mistakes.” If they are able to escape a fisherman’s line once, it is likely that they will internalize this and know to avoid similar hooks and lures in the future. It is also believed that bass are able to see the color red most distinctly. Bass typically live to be about 16 years old, but have been known to make it all the way to 20. One of the many reptiles that lives at the Park is the Eastern Box Turtle. This turtle, which is the state reptile of Tennessee, gets its name from the fact that it is able to completely box itself inside of its shell, which other turtles are not able to do. However, because of their extensive shell and short legs, if they somehow roll onto their back, it is very unlikely that they are able to roll themselves back over. Up until they reach the age of 7, their shell is soft which makes them an easy target for predators. However, most do end up living to be about 30 years old, and some even make it all the way to 100! Come see Tennessee’s favorite turtle! But remember, if it’s hot out, they like to hide in the mud. The Park is also home to North America’s largest frog, the Bullfrog. This amphibian can be as long as 8 inches and can weight up to 1.5 pounds. You can spot them by their green skin with brown spots and their circular, exterior eardrums (tympanum), which are easily seen on either side of their head. It’s even easier to find them by following their signature call which sounds like a cow’s moo. It is this call that got the frog its name. This invasive species can be not only be found all over the country, but also in Europe and Asia. Where else are you able to find such a wide variety of wild species in the middle of urban America? Now that you know what to look for, come explore your Park today! Need to plan a great date? Take a spin on a bike made for two! There’s no better way to get in sync this Valentine’s Day than to cozy up and hit the the trails on one of Shelby Farms Park’s tandem bicycles. With 10.6 miles of Greenline and miles and miles of other trails, you can spend the day cruising in style. Find your bike here. Take the scenic route! Hit the trails and spend the day getting lost with someone special. With more than forty miles of trails, this is the perfect way to disconnect from your busy day-to-day routine and spend some quality one-on-one time in nature with the one you love! Follow the map here. Get your hearts pumping at a free workout class at the Park! Find your zen with some yoga, get fit and strong by the lake, or find your balance with our mental wellness class. Whichever you choose, these are all sure to get your endorphins going! Find the class schedule here. Channel your inner kid! Or make it a group date, and have fun with paintball or laser tag! This is the perfect lighthearted way to get competitive and have a ball with your Valentine! Learn more and book your session here. Get adventurous and go horseback riding here at Shelby Farms Park! Let your hearts run free on one of our guided horseback rides. Schedule your ride here. Relax and recharge after a day of Valentine’s adventures with a romantic dinner or sunset cocktail at The Kitchen Bistro. With a heart-stopping view of Hyde Lake, there’s no better way to dine and unwind with your Valentine this February 14. Give their special Valentine’s menu a glance and make your reservation now! Last, but not least, spend some time giving time together! Extend your Valentine’s celebrations to February 17 and volunteer with us at the Weed Wrangle! We are looking for Volunteers age 16+ to help us remove invasive Chinese privet plants from Park paths. 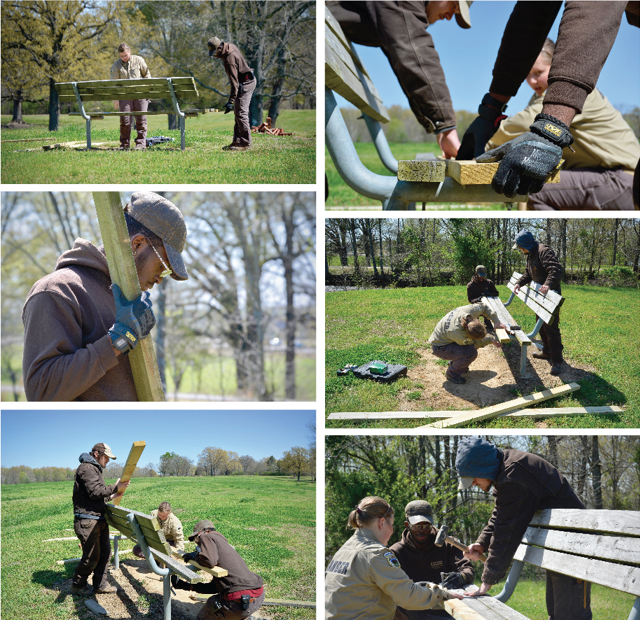 Spend time with your Valentine while helping to improve your Park! Learn more here and join us! for Valentine’s Day this year -- let us know why you #LoveThePark on social media! 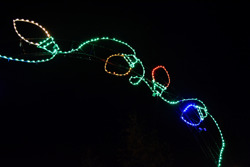 The magic of the holidays is in full swing at Starry Nights, presented by International Paper! The lights will be shining nightly through December 29 (including Christmas Eve + Christmas Day), and we’ve put some tips and notes together to help you make the most of your visit. Proceeds: All proceeds from your ticket purchase support daily care of Shelby Farms Park and Shelby Farms Greenline. Entrance: If you plan to purchase a ticket when you arrive, you will enter via the main entrance off of Farm Road. If you have pre-purchased a ticket, you will enter through the pre-sale entrance at Gate 10 on Mullins Station Road. 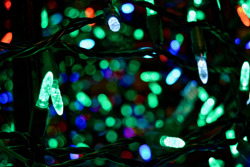 Fridays and Saturdays are the busiest evenings each week, and Christmas Eve is one of the most popular nights to attend. If you’re looking to save time in line, consider attending on a weekday. You can save time any day that you attend by pre-purchasing your ticket. 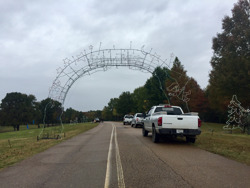 Pre-sale ticket holders have the option to enter through a separate entrance on Mullins Station, skipping the line at the main entrance off of Farm Road. Tickets can be purchased in the Lake’s Edge Gift Shop (no extra fees) and online via Ticketmaster here (additional processing fees may apply). Pre-sale tickets may be printed or shown on your phone. 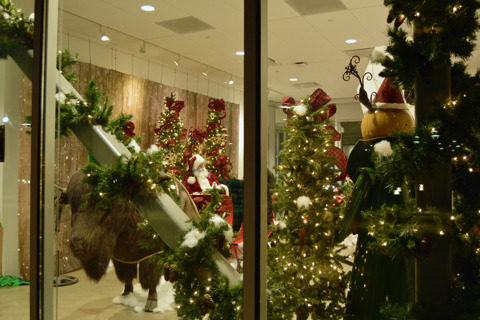 The First Tennessee Foundation Visitor Center (a new location) has transformed into magical Mistletoe VIllage. Here, you can experience the magic of the holiday with the whole family! There is no extra cost to park and visit the Village, but some activities have small fees (details below). While you’ll have an opportunity to visit Mistletoe Village halfway through the drive, we recommend visiting before you start your drive through the lights. Mistletoe Village is open rain or shine, and indoor restrooms are available. An ATM is also available inside -- most of our vendors accept cards, but you can access cash here if you need it! The man in red has set up his workshop in magical Mistletoe Village! Here, you can meet Santa (and sometimes Mrs. Claus), take photos and share your wishlist in a special mailbox that ships straight to the North Pole! There is no cost to visit Santa, but photo packages start at $25 (digital and print options are available). Santa's last night in the Vilalge will be December 23. Mrs. Claus will stop by during Starry Nights on December 15 and in the afternoon on December 22. You can also visit Santa from 1pm-5pm Wednesdays-Sundays through Decemebr 23. Grab a cup of hot chocolate and a s’more kit from Kitchenette and cozy up around a crackling fire. S’more kits are $3 and include all of the elements for two s’mores. Food trucks are on site, so grab a bite before you head through the lights! Make some new fuzzy friends and even ride camel! Petting zoo admission is $3 per person, and camel rides are $5 per person. Want to save $5 at tickets purchased at the main entrance? Participate in a theme night! We have one more coming up on December 14. Get details here. Race through the lights of Starry Nights in the Starry 4K Fun Run/Walk! This family friendly race is the last chance to see the lights in 2017, and it’s fun for all ages. Each participant will receive a scarf. Scarves cannot be guaranteed for race day registrants, so sign up ahead of time to guarantee yours! Learn more about the race and register here. 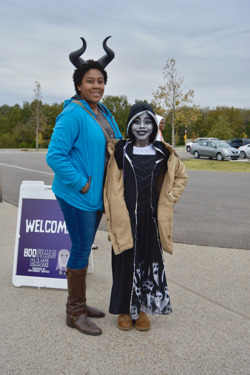 We had a great time at the Booffalo Bash, presented by ARS/Conway Services! 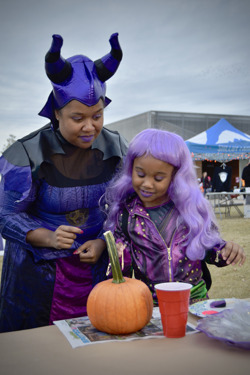 This new Halloween event featured Trunk-or-Treating, pumpkin painting, spooky story telling, food trucks, music and more. 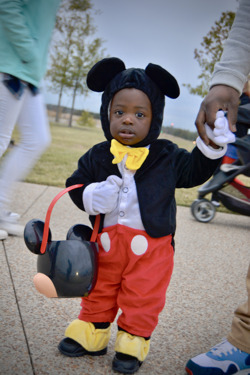 We love celebrating Halloween with hundreds of little Park fans! Check out the pictures below from the event. For centuries, the bison population numbered in the millions. Herds roamed freely, and the animals played a crucial part in the ecology, the economy and culture of the United States. As communities began to grow and move westward, bison were hunted for sport, and they were hunted to the brink of extinction. With population numbers dwindling, conservancies formed across the country began working to protect the bison and to improve their habitats. 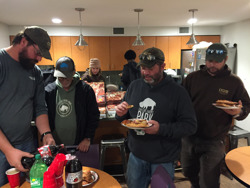 Thanks to these efforts, bison are no longer considered endangered. 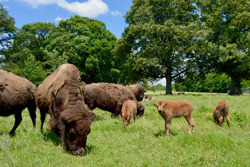 How did Shelby Farms Park wind up with a buffalo herd? 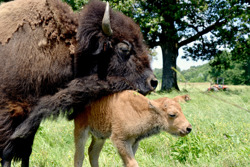 Buffalo have been at Shelby Farms Park since 1989. The Shelby County Superintendent for Shelby Farms Park - Tommy Hill - brought six buffalo and two longhorn steer to the Park from Tennessee Safari Park in Alamo, Tennessee. They quickly became popular Park inhabitants and have lived there ever since. So, are they bison or buffalo? In addition to grazing, the Shelby Farms Park herd consumes 50,000 pounds of hay and supplemental feed each year! 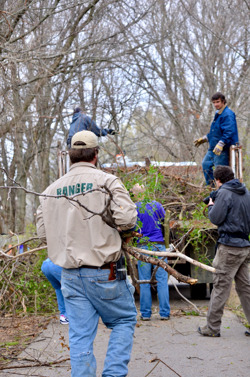 It takes $11,000 and more than 1,000 Ranger hours annually to keep the herd in tip top shape! Males are called "bulls" and females are called "cows." Males can weigh up to 2,000 lbs. Males and female buffalo have short, curved horns, which they use in fighting to defend their status within the herd. Buffalo typically mate in August and September and have a 9-9.5 month gestation period. 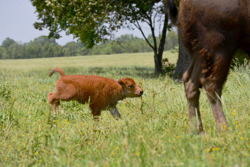 Calves can stand soon after they are born and can walk with the herd in just a few hours. Calves are born with a rusty red coat which gets darker as they grow up. Buffalo can run up to 30mph. Buffalo wallow in dirt or mud, both to remove molting fur patches and to deter flies from biting. Bulls also wallow in mating season to display strength and vigor. 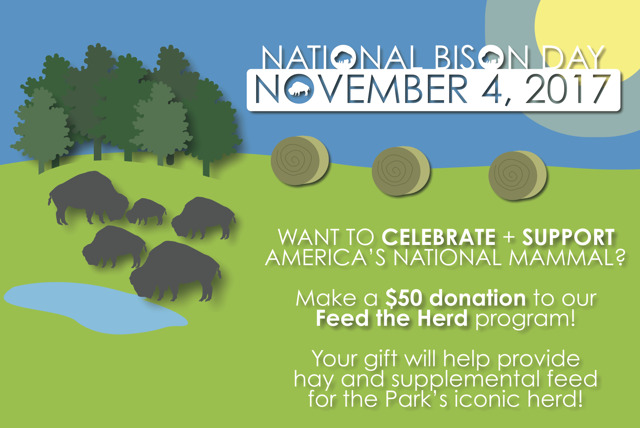 You can help support these awesome animals by making a contribution to our Feed the Herd program, which helps provide hay and supplemental feed for the Park’s iconic buffalo herd. Learn more and make your gift here. 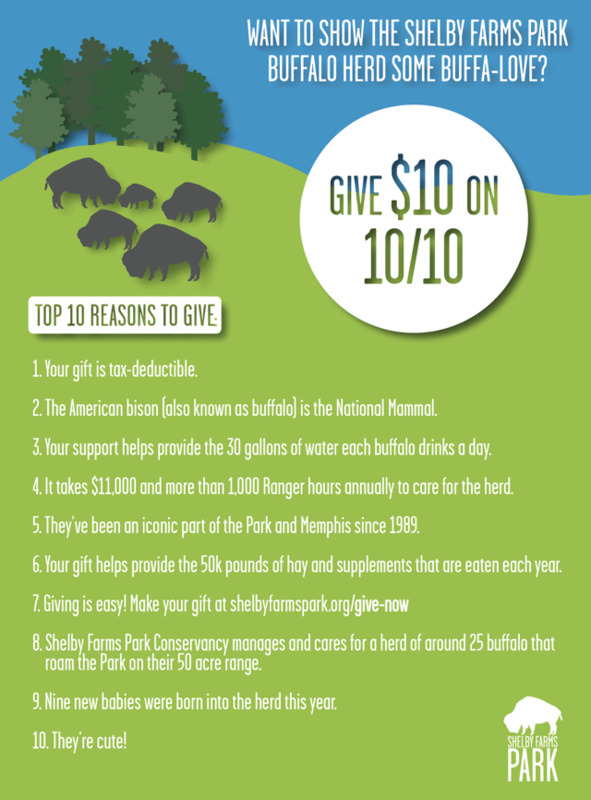 Supporting Shelby Farms Park's iconic buffalo herd has never been easier! Give $10 on 10/10/17 to help keep the herd in tip-tip shape! Need a few reasons to give? Check out the list below! Click here to give $10 today! Happy birthday, Heart of the Park! Happy 9/01 Day to our Memphis Park fans, and happy birthday to Heart of the Park! 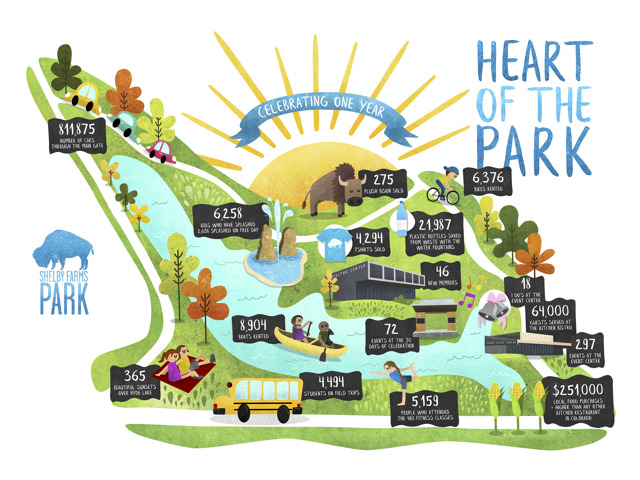 Today marks one year since we officially cut the ribbon on the Park's most ambitious improvement project to date, and we want to share some of the exciting things we learned about Heart of the Park's first year! Check out the graphic below for some fun facts and figures. We have loved seeing so many visitors playing, celebrating, learning and growing in this special space, and we are excited to share it with you for many years to come. Thanks for loving your Park! Caring for a big park is a big job! Want to help support the trails, lakes and green space you love? Learn how you can support the Park as a Member, a volunteer or donor here. Summer Camp is officially over and hundreds of Mid-South kids in grades K-6 had fun in the summer sun at Shelby Farms Park! 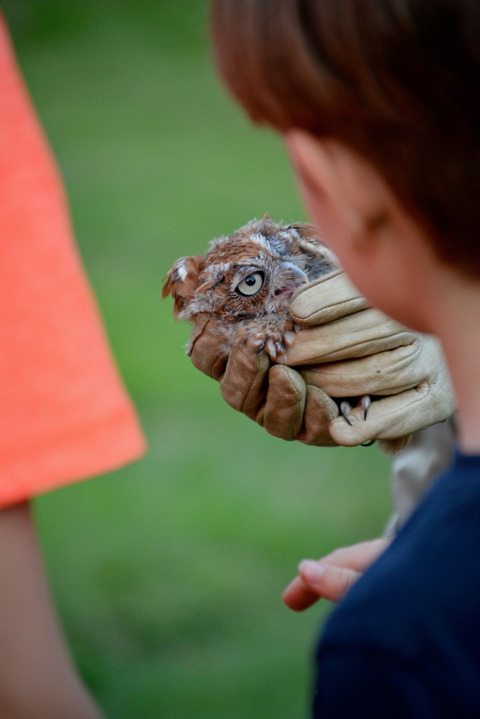 Shelby Farms Park Summer Camps encourage kids to connect with nature through exploration, inspiration, discovery and fun. Our campers enjoyed nature hikes, archery, water recreation, fitness classes and environmental education sessions that are tailored for the ultimate in outdoor summer fun! Summer Camp was made possible by our friends at ARS / Conway Services. Their team came out to help our campers make recycled binoculars for a group nature hike. 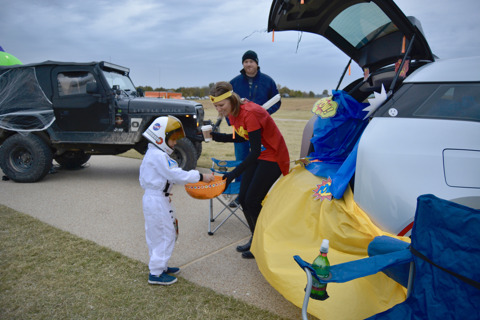 We’re not sure who had more fun -- the kids or the adults! Check out photos from this fun adventure here. 2018 Summer Camp dates will be announced in December. Remember, these sessions fill up quickly, so stay tuned for that announcement! Do you have a corporate group that would like to get creatively involved like our friends at ARS / Conway Services? Learn more here! Shelby Farms Park and Shelby Farms Greenline are great places to get moving! It is especially tempting to be active outdoors for as long as possible on beautiful summer days, but those sunny days can take a toll on you when you workout. Check out some simple tips below to help you beat the heat this summer! 3. Hydrate, hydrate, hydrate! Drink plenty of water before, during and after your workout. 5. Listen to your body -- If you need a break or need to stop, do it! Stay cool out there, Park fans! How many miles do you cover on the Greenline each year? No matter the distance, if you run, bike, walk or skate on the trail, your miles are made possible by our friends at Campbell Clinic Orthaopedics! Why does Campbell Clinic sponsor the trail? We talked recently with Chad Gilbert, Director of Marketing - who is an avid runner and a big fan of the Greenline - to find out. 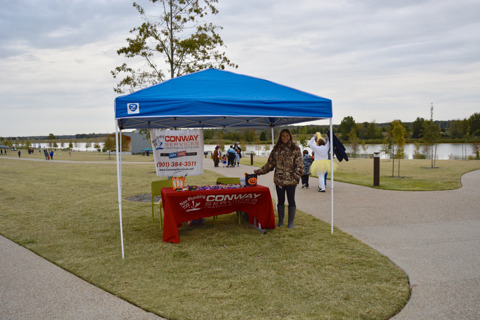 Q: Campbell Clinic Orthopaedics has been a long-time supporter of Shelby Farms Park. Why is this relationship so important? A: Our organization believes that physical activity is an essential part of a healthy lifestyle, particularly if someone is recovering from an injury. 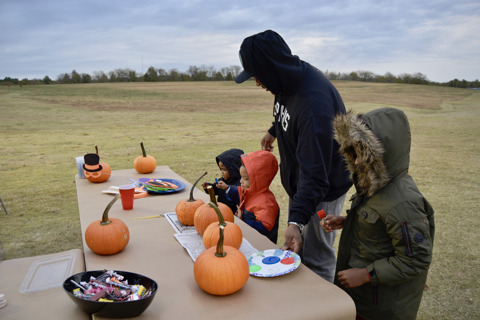 Living in Memphis affords us great weather nearly year-round to get out and enjoy the outdoors, and Shelby Farms Park is the crown jewel of Memphis outdoor recreation and activity. It’s convenient location near our Germantown and Spine Center clinics enables many of our employees to access biking and running trails before and after work, and it is a wonderful place for our employees to enjoy nature with their families on the weekends. We encourage our patients to return to some form of exercise after they recover from injuries. Shelby Farms Park is the ideal location. 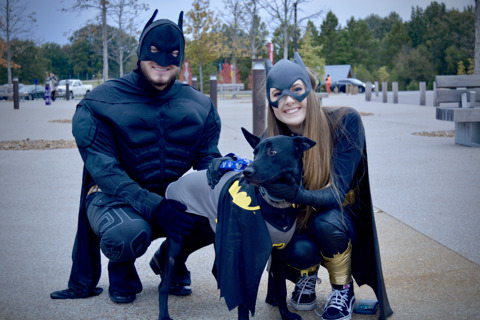 Q: Shelby Farms Greenline is an iconic trail in Memphis and is enjoyed by thousands of runners a year. What are some tips you have for a beginning runner who may be hitting the Greenline for the first time? A: The Greenline is a wonderful asset for our community. For new runners, it’s important to set a reasonable but challenging training plan and stick to it. When someone begins training for a race or running for leisure on a great trail like the Greenline, their instinct is often to go as far as they can, as fast as they can, during the first few runs. For someone new to the sport, overuse injuries can sideline you before you really even get started. Stretch before a run, get in a good warm-up, and, afterwards, be sure to cool down. Rest between running days and find other ways to cross-train so you don’t overwork the same muscle groups and joints. Focus on your form and maintain good running posture. Finally, during the warm spring and summer months, remember to bring a bottle of water and stay hydrated before, during and after your run. Q: Why do you enjoy running the Greenline rather than your neighborhood or other trail? A: I enjoy the Greenline because it acts as sort of a centerpiece for the entire trail system in the park, so it’s easy to mix in roads and softer trails during the same run. It affords you the opportunity to be in the city but also surrounded by nature. Q: Other than running on the Greenline, what’s your favorite thing to do at the Park? When I’m not running the Greenline or the trails, I enjoy the Go Ape zip line course or taking my family out for a walk around Hyde Lake. Q: How would you describe Shelby Farms Park in three words? 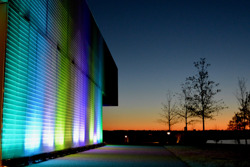 Welcome to Shelby Farms Park's new website and Park Life Blog! Here, you will find information about what's going on at your Park along with tips for planning your next play day.